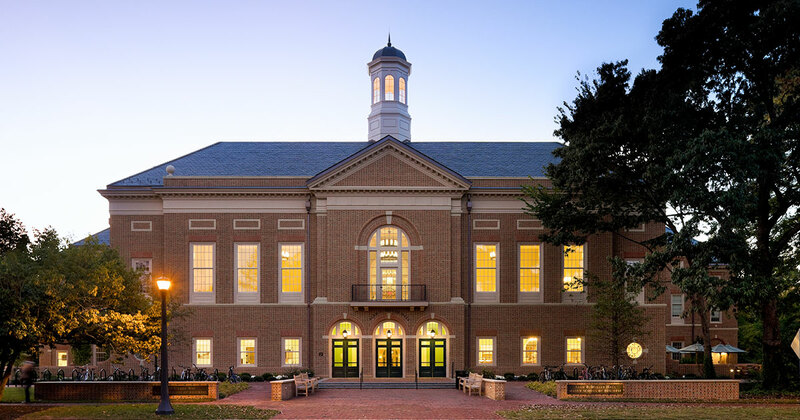 Using no Federal or State funds, Alan B. Miller Hall is a $75 Million Public / Private Partnership investment between The William & Mary Business School Foundation and William & Mary. After five years of careful planning, construction started in 2007 and Miller Hall opened in the fall of 2009. Our mission to offer high-quality educational programs and creating and communicating new knowledge is delivered by a world-class faculty and our building, Alan B. Miller Hall. Designed and built as a “world-class” building, Miller Hall enables all of Mason’s students to experience personalized business education and become today’s "Revolutionary Thinkers" and tomorrow’s businesses leaders. From the start, the Foundation’s conceptual designs and capital budget for Miller Hall included art. We have always recognized that the combined world-class architecture and art of Miller Hall provides unique learning experiences and clearly differentiates the Raymond A. Mason School of Business from other business schools. The art collection here in Miller Hall directly supports our Mission and plays key roles in the personal and professional lives of our faculty, staff, students and guests. As we experience the art collection, we see first hand how it brings Miller Hall to life and brings life to Miller Hall. Our art inspires us to think creatively and see things differently. It slows our pace to reflect on and celebrate our history and heritage. At the same time, it quickens our pace and encourages all of us to be creative, entrepreneurial and Revolutionary Thinkers. As a reflection of the diverse world in which we live, Miller Hall’s diverse art collection also reminds us that beauty comes in many colors, dimensions, expressions and forms.